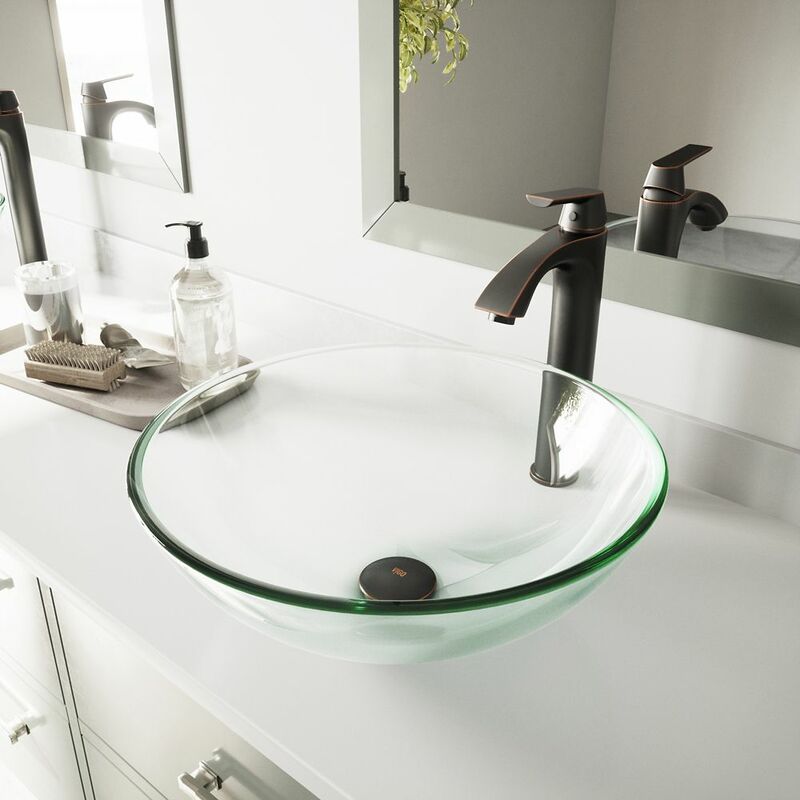 Glass Vessel Sink in Crystalline with Linus Vessel Faucet in Antique Rubbed Bronze is rated 4.8 out of 5 by 18. Rated 4 out of 5 by Joetta from Beautiful and durable We have had them installed for two months and couldn't be happier. Rated 5 out of 5 by Jeremyswife from Great value and has everything you need. It saves the... Great value and has everything you need. It saves the headache of finding a drain to fit the sink and is reasonably priced. The package arrived on time and is well packed. Each item has cushioning and its own box. The sink is larger than expected. Installation was easy and it looks beautiful. Rated 5 out of 5 by DRBishop from I bought this Glass Vessel kit while on sale at... I bought this Glass Vessel kit while on sale at Home Depot. I put in new granite counter tops and the kit looks amazing. It was simple to hook up and had all the parts needed except for a drain extension that I had to go back out and buy. The Faucet looks and feels great and the pop up drain makes it easy to capture water when shaving. Rated 5 out of 5 by RT from Very nice. Easy to install.... Very nice. Easy to install. Rated 4 out of 5 by Shirlz from I am very happy with this sink and faucet. It... I am very happy with this sink and faucet. It looks great and was a real bargain. Rated 5 out of 5 by Sheryl from Was very impressed with the packaging as it was very... Was very impressed with the packaging as it was very professional with everything covered in cloth and then boxed with foam. Easy installation and it looks awesome! Great product for unbelievable price! Have already more sets! Rated 5 out of 5 by Sam from Great for the price i got it for. Met my expectations really nice faucet and vessel. Everything g... Great for the price i got it for. Met my expectations really nice faucet and vessel. Everything got here in good condition.